Six Kitchen Tools Every Beginning Baker Needs – These are the tools you will most likely need if you’re starting out as a baker. In the 15 years that I’ve been baking, I have acquired almost every kitchen tool and gadget that you can think of. I’m not kidding. I have some random stuff: a french bread pan, a cherry pitter, two fondue pots (why two?! ), and multiple candy molds. These obviously aren’t the essentials. So what are the essentials? 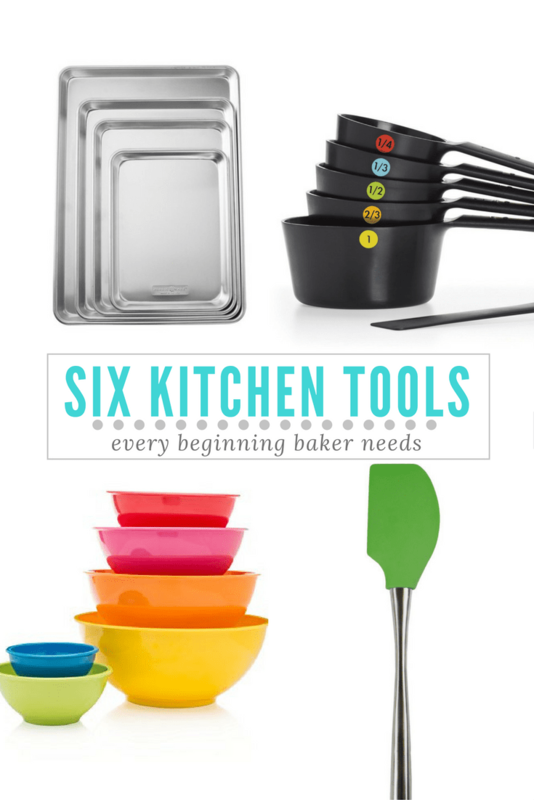 What tools does every beginner baker need to have? You will use these bowls for everything: servings, mixing, and even eating! I use the medium pink one for large salads all the time. Also, there’s nothing more annoying that not having enough bowls to get through a recipe. Then you have to stop what you’re doing, wash and dry a used bowl before you can get that cake done. When you have a set of mixing bowls, you’ll never run into that problem again. I love these mixing bowls because they nest into one another so they barely take up any space. You will use a spatula a lot! It is the best tool for scraping dough and batter out of a bowl. The flat edge at the top helps with smoothing out cake/brownie batter to they have even coverage on top. I’m not talking about anything fancy. By good-quality, I mean one where the silicone head won’t come off after going in the washing machine. This happened to me. Twice! Never again will I buy a cheap spatula. This is the one I use now and it has been my favorite one of all time. Even better than the Le Creuset ones I have! It’s so smooth and agile so I can easily scrape dough out of a bowl. This may sounds like an obvious one but in case you were on the fence, this is non negotiable. Baking is so exact so you can’t just “eye-ball” your ingredients. I use them everyday and for pretty much every recipe. If you want to get really serious, I recommend measuring spoons that have 1/8 teaspoon. You’ll be surprised how many times you’ll use it. If a recipe ever says to add a pinch, you can use 1/8 teaspoon if you don’t know what a pinch looks like. These cups and spoons are great and will do the trick. If you only want to buy one type of pan, you need baking sheets. This was the first pan I ever used when I started baking (for cookies, of course!) and still the one I use the most. You can use them for both baking and cooking. In fact, I use them all the time to make some wicked roasted potatoes. What do I mean by sturdy? Non-flimsy. Still not sure? You want pans that don’t warp or bend when they are baked at high temps (>300 degrees). Have you ever baked something on a baking sheet and then, all of a sudden, hear a sharp sound, like the pan is bending in half? That’s the sound of it warping. I just bought these half sheet pans and they have changed my life. They are heavy, duty so they don’t warp and they cook so much more evenly than my cheap ones. Because they’re so thick, they trap heat better, creating a stable baking environment. You can’t beat that, especially when you’re baking fussy foods like croissants or macarons. A whisk is a bakers best friend. You will use it to whisk eggs, mix pancake batter, make a chocolate ganache, you name it! And if you don’t have a hand/stand mixer, you will use it even more. Do not underestimate the power of a good whisk. I bought one from my local grocery store because I was desperate. Well, to no one’s surprise, a few months after I bought it, it began to rust at the handle and then suddenly the base of the whisk just came undone. So it pays to invest in a good whisk with a good handle. Here’s a good one . It has a great handle and a sturdy whisk head. I don’t like the whisks with a silicone head. I have one now and I barely use it because it just doesn’t give me the leverage I want when I’m whisking things together. It’s just too flimsy. Since the head is silicone and not metal, I feel like it drags me down when I’m whipping. Not a fan. When you need a rolling pin, there really is no substitute. Have you ever tried to roll out sugar cookies without one? It’s ain’t pretty. 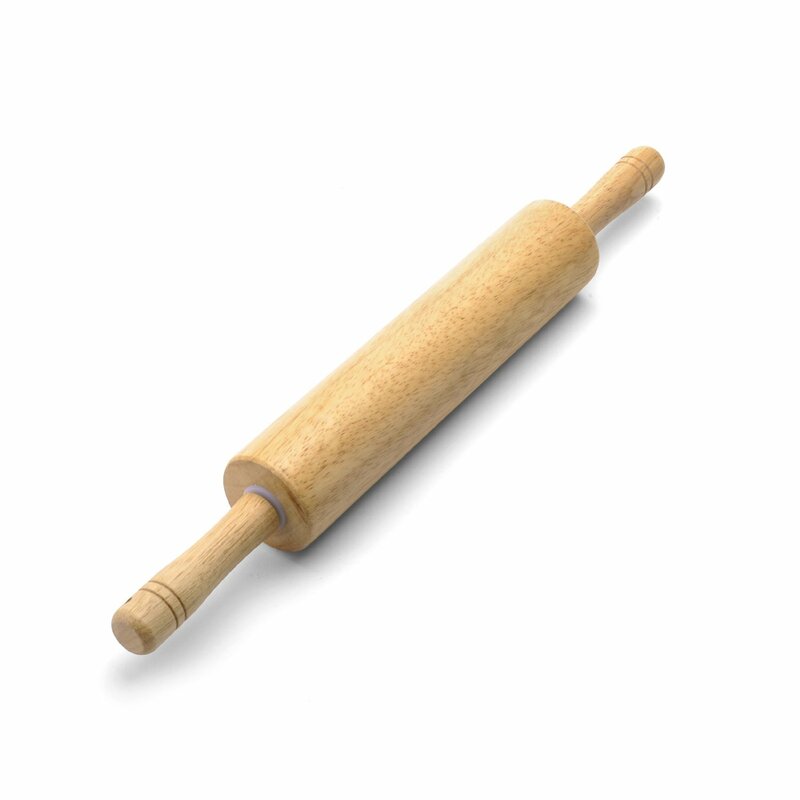 A rolling pin is used for many classic recipes: pie crust, biscuits, cookies, puff pastry, cinnamon rolls and many more. Once you have it in your home you’ll find a lot more uses for it that you’d think: crushing graham crackers for pie crust, turning corn flakes into crumbs, and smashing Oreos to make these truffles. Mainly crushing things. But it really works! You don’t need to spend tons on a rolling pin. This one is similar to the one I have and it’s super affordable. Now you’re equipped to start baking up a storm! Is there anything else you think needs to be on this list? Are there other kitchen tools you want advice on? Let me know in the comments below! To this list I would add great pans. I’ve been using Fat Daddio’s pans for two years and am slowly replacing all of my cake pans with Daddios. Why? Because the grocery store cake pans, and even better quality pans, allow the cake layers to cook too fast on the edges (which makes for domed layers). Daddios bright anodized aluminum pans cook far more evenly and the cakes are moister and never dried out on the edges. Daddios come in a fantastic range of sizes and shapes. They release the cake cleanly when prepared with Baker’s Joy or other pre-gressing routine (but why use anything other than Baker’s Joy?). I add that because I was devoted to teflon pans (which are dark and like all dark pans, over-bake anything you put in them). I have no connection at all with Daddios-I’ve just spent a lot of money on their pans! They are roughly twice as expensive and well worth the money. I order from the website, but I have seen some Daddios at Bed, Bath and Beyond. Lovely post! I think I have the same baking sheets. I just found them last year and they are wonderful! I would include either silicone mats or parchment paper too but they aren’t truly necessary. They just make things a little easier. Exactly! I was on the fence about adding in parchment paper because I go through a roll so much. Thanks for the tip! You’re so welcome! I am so happy you found it helpful! Good luck! I wish that by having these things I could automatically be a good baker… LOL! I can cook fantastically… Baking, that’s a whole other story! Haha I get what you mean. It takes practice but there are tons of recipes that are easy for new bakers. Especially my 3-ingredient truffles! I love this!! I want those mixing bowls!